Lester Simpson. Composer, writer and broadcaster has escaped Messer Coope and Boyes to perform a solo booking. Expect some great singing of both traditional and self penned material coupled with a great sense of humour and insightful anecdotes. 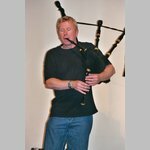 Lester also plays melodeon and bagpipes. Come early a good night will be had by all.